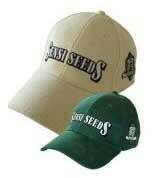 The classic Sensi baseball cap has been re-released with a couple of stylish changes. This essential accessory item now comes in British Racing Green and Champagne White, but it´s the extra attention paid to the detailing that really makes it special. In place of the ´Smoking Lady´ logo, the front carries the name Sensi Seeds in the iconic font, which is fully embroidered for aesthetic durability. A new decorative feature on the side of the cap is the ´shield´ logo commemorating our silver jubilee, adding extra impact and extra interest for collectors. 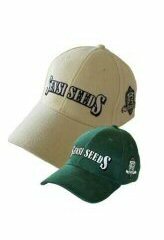 The back of the cap is adjustable as before, but the previous version´s basic sliding buckle has been replaced by a sturdy metal clip embossed with the Sensi ´S´. This new clip holds the strap in place very securely, even when pulled on! Another nice touch is the metal eyelet for the rest of the strap to feed through, keeping it out of sight and giving the cap a neat, streamlined look.